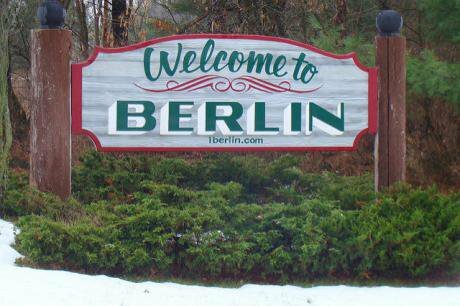 A sign welcomes visitors to Berlin, Wisconsin - one of many American settlements named after German towns and cities. Flickr/Doug Wallick. Some rights reserved. In political psychology, even schizophrenia is normal. When citizens of any state are at home, they want to know that their state borders are defended and policed as rigorously as possible. But when they travel abroad, they want borders to be as porous as possible, and ideally invisible. They don’t want to be held up at borders, but they want others entering their country to be stopped at the border and prevented from entering. At their destination, they want to experience the ‘Other’ as ‘an interesting different culture’, but at home they perceive the ‘Other’ as a threat to ‘our culture’. The sudden disappearance of borders can spark euphoria, as we saw with the fall of the Berlin Wall, and indeed of the rest of the Iron Curtain, but citizens want the borders back again when it appears that the people from ‘over there’ want to come over here looking for work. They drive ‘over there’ themselves if it’s cheaper to buy stuff there, but they don’t understand it when people want to come ‘over here’ to earn more. When they want to claim their human rights, concerned citizens can quote chapter and verse to prove these are ‘universal’; but in the face of claims by others they want to fence them off as a part only of their own national law. This is what passes for ‘normality’ nowadays. Historically, however, political borders are anything but normal. On the contrary, the system of political borders, which today are generally regarded as normal and which are once more being constructed and defended, is the historical exception, and in the foreseeable future it will be regarded again as a short and untypical historical interlude. The so-called four freedoms (the freedom of movement of people, goods, services and capital) are the greatest post-war achievement of the European integration project; however, they are not a new phenomenon in European history, but only a step towards the restitution of historical normality: an absence of borders was the natural state of affairs in Europe from the Middle Ages until well into the 19th century. In the Middle Ages, the German Reichstag, or Diet of the Imperial Estates of the Holy Roman Empire, was a peripatetic – a sort of mobile – assembly with no fixed location of the German Prince-electors in different European cities from Luxembourg to Prague, not all of which still lie within the borders of today’s Federal Republic. Medieval students followed their teachers from Rotterdam as far as Bologna. Cultural, culinary, linguistic, religious and geographical borders, certainly, but not national ones, were important and palpable in Europe, but these cultural borders did not divide: on the contrary, they bound Europe together. Even topographical borders such as rivers or mountains were not able to divide homogenous cultural regions: the Basque people live south and north of the Pyrenees, the Tyroleans south and north of the Brenner. The Rhine, on the other hand, never became the national border of France. And it was possible to travel from the heartlands of the Habsburgs through Bohemia and Moravia to Galicia on tracks which, for hundreds of kilometres, crossed no borders. Moreover, what we understand today of the term ‘passport’ has only existed since 21st October 1920. That was when the League of Nations defined what should be in a passport and how it should look in order for it to be recognised by the world’s states as a document enabling travel and the crossing of borders. The preamble to the League’s definition of an internationally-recognised passport is interesting (but sadly forgotten): namely that the introduction of the passport had only provisional validity until the ‘complete return to pre-war conditions which the conference hopes to see gradually re-established in the near future’. To think of today’s borderless ‘Schengen Area’ as a unique historical phenomenon, an absolutely revolutionary achievement of the recent European history of integration, is therefore misleading. On the contrary, it is important to remind people that a borderless Europe was, for hundreds of years, accepted as the normal state of affairs, simply so that we can talk about what this European area should be today – namely, what it always was: a palimpsest of borders, which actually aren’t borders at all, but which instead merely defined the cultural regions that have always created out of the cultural diversity of Europe the single European space. To remind ourselves of this is also important so that we can discuss how the European region can and should manage the refugee crisis. If Europeans understood European history, rather than simply believing that what they now know as normality, then it goes without saying that they would wish to re-establish the historically normal state of borderlessness in Europe that endured for hundreds of years and which was only brutally and bloodily destroyed in the 20th century by the two world wars – by Europe’s ‘second Thirty Years’ War’. But the EU today is distancing itself at great speed from precisely that option, and not just since the so-called refugee crisis, which is being exploited as an opportunity to link back to the darkest chapter of modern European history, with border controls and border fortifications, with even the construction of fences and walls within Europe. In fact, in the European discourse, to see the EU as a project whose founding purpose was to Europeanise Europe again and to overcome the nation-states, is an ambition that was already abandoned some time ago. There are many reasons for this: the contemporary political elites are too young to have understood at the time the founding purpose of the European project, but they are too old to be able to imagine anything other than what they are used to – the national system in which they have made their careers. And what they know for certain is that they are only elected in national elections, which is why they must maintain the fiction of national interests in order to rally the support of their electorates for their offices, though not for the European project. The refugees are now intensifying this regression at the European and the national level. If a European solution to the refugee issue is not in sight – neither with regard to the repartition of refugees within Europe, nor, as a minimum, to common defence of the external borders, as is now often being called for – and if in addition a common and coherent European foreign policy has yet to be realised, then all that remains is the flight to national withdrawal; which, however, is available in practice only to those European states without an external EU border, for example Germany or Denmark. But Greece or Italy, or the countries on the Balkan route – whether EU members or not – have no choice: they will be overrun by refugees whatever they do to prevent it. Because as long as the EU doesn’t decide to lay barbed wire across Mediterranean beaches, or to turn back refugee boats with armed force, the sea border of the EU to the south cannot be ‘defended’: the EU cannot cut itself off from the Mediterranean – which, it is worth remembering, is in cultural historical terms, as the Mare Nostrum, the quintessential European sea – and from whose trade routes the EU most certainly does not want to cut itself off. The question today is therefore how it will be possible in future on an organisational level to deal with the fact that Europe wants and needs open borders for trade, but not for people. The fact that the border closures that have already taken place and those that are to be expected within the EU may affect (and threaten) lorry traffic – and thus business, production, trade and consumption, and ultimately our living standards – and that closed borders mean quantifiable bottom-line costs; that just-in-time management and efficient customer inventory management are only possible if lorries are not wasting time held up at borders; all of this is now beginning to dawn on the economic ministers of the member states. But a border that is open to lorries and at the same time closed to refugees is not possible. The only realistic option that remains for the EU is to open up – it will have to share its space and its place with the ‘others’: with the people who want to come to Europe. There are, at this moment, 60 million people fleeing war, hunger and destitution around the world. The USA, Australia and Canada, each of which only grants asylum to around 10,000 refugees each year, have effectively withdrawn from the 1951 Geneva Refugee Convention, which stipulates that the community of nations has a shared responsibility towards refugees, and that every refugee is entitled to asylum. Social welfare entitlements for state citizens arise out of civil rights; basic human rights to shelter and to welfare provision arise out of the right to asylum, independent of citizenship, and both are increasingly merging into one. Everyone has a right to a homeland and to security. In times when many are forced to become nomads in search of a new home, the decisive question becomes: how can this process be organised without conflict and in a way that is humane for all? The Belgian author and psychoanalyst Luce Irigaray coined the expression ‘sharing the world’ as a modern extension of Kant’s ‘right to universal hospitality’, which assumes that all people are born equal and therefore have an equal right in principle to live anywhere in the world. Given this human right, states cannot define a territorial right of abode for people. In the future, the challenge must therefore be to organise extra-territorial democracy and to realise the promise contained in the Universal Declaration of Human Rights: that the recognition of human rights should be independent of any specific ‘state citizenship’. The coming climate catastrophe, with all the consequences of the global reduction in fertile soils it will bring about, will put nation-states under even greater pressure: they will be unable to maintain their insistence on territorially-based statehood as a privilege which enables them to reserve land within their state borders for their own citizens (and for millionaires who buy their way in). This applies to the European area as well. So it’s about the globalright to a homeland; about universal access to the global commons beyond the nation state; about providing a homeland for all in times of permanent migration. In the future, everyone must have the right to cross national borders and to settle where they want, especially since, for everything else except people, the globalised world is already one single system of networks, of permeability and of borderlessness: from pipelines to broadband to the high speed trading of the financial markets and product supply chains, everything has in practice functioned for a long time already unhindered by national borders. The challenge now is to reflect this fact in a new political institutional system. What is needed is to develop a political form of the diverse and many-layered global network, instead of delimiting national enclaves which cannot be justified in Kantian terms. What is needed is for homelands to be bound together: this must include bonds in both the legal and normative senses. The legal bonds tie everyone to one constitution; the normative bonds enable the participation of all in whatever affects all. Everyone has a stake in the system, and everyone contributes to it. What is needed is the free organisation of ‘Otherness’ in a legal system of obligations, in the words of Luce Irigaray; that is, a novel form of direct connection between the local/regional and the globalbeyond the state, and thus a merging of asylum rights and human rights. This leads to the creation of an unlimited transit area. In future, it would no longer be the salvation of ethno-cultural homogeneity by homogenous populations which would count as ‘European’, but the dissolution of borders as limits to homogeneity. This creates a gigantic space of potential for real life plans and modes of living existing alongside each other. Sociology teaches us that segregation is also a form of tolerance. Against this background, the question arises of whether the current EU refugee policy is the correct one, focused as it is on integration, which carries with it the risk of large-scale social unrest. Giving space to the 'others': cities for migrants? Let us look back into recent history to seek inspiration from solutions that have already proved to be sustainable: what did the European migrants do who emigrated to the New World in their masses during the famines and political crises of the 18th and 19th centuries – the Irish, the Italians, the Balts, the Germans…? They built their cities there again. Across America we find cities with names such as New Hannover, New Hampshire, New Hamburg, and so on. In Little Italy in New York, the Italians occupied an entire district. It didn’t occur to anyone then to divide families, or to place them in separate accommodation, or to haggle over family reunification. Nobody was given asylum-seeker status, or received state money, or had to commit to language courses or even to a ‘Leitkultur’, a dominant national culture. The European refugees simply arrived in a newhomeland and reconstructed their old homeland there. We can learn from that. What if refugees in Europe were to be allocated building land neighbouring the European cities, but at a sufficient distance to maintain ‘otherness’? That would create a space of potential for real life plans and modes of living existing alongside each other. In this way, New Damascus and New Aleppo, New Madaya and so on could arise in the middle of Europe. Or New Diyarbakir or New Erbil and New Dohuk for the Kurdish refugees. Perhaps also New Kandahar or New Kunduz for the Afghan refugees, or New Enugu or New Ondo for the Nigerian refugees. Europe is large (and will soon be empty) enough to build a dozen or more cities for new arrivals. Then we don’t need to stress over integration. We don’t need to cram the refugees into our – sometimes dilapidated – suburbs or into the – sometimes sprawling and desolate – no man’s landscapes in the countryside between them. We don’t have to concentrate them in refugee homes to be burnt down to warm the hearts of patriotic nationalists. We don’t have to play off their rights to housing and work in their new homeland against housing and jobs for the lowest quartile of our own society. We don’t need to rub up against each other and rub each other up the wrong way. In short: we don’t need integration. We respect ‘otherness’ – and we let the new arrivals be in their ‘otherness’. The new arrivals then look after themselves, in accordance with their culture, cuisine, music and social structures. They recreate their cities in Europe, their squares, their schools, their theatres, their hospitals, their radio stations and their newspapers. And EU law applies to everyone. And that is important:Aequum ius, equality before the law – for old EU citizens as well as for the new arrivals. Instead of ‘Leitkultur’, civic rights for all. Europe gives building land as support to get started – improved land, that is, land already connected up to infrastructural services such as energy, ICT and transport, but otherwise free for development by the new arrivals. All the money that we now give out for integration and language courses, for fences and border protection, for security and policing, can be given by Europe to the refugees to help them make a start. As urban construction is not a quick process, Europe, with the support of the UNHCR, can help to begin with by providing temporary dwellings – that is, exactly the kind of container dwelling that is provided now. Town planners who are involved with refugee camps and who have researched them report that refugee camps soon turn intotowns, as long as the refugees are left in peace. Building towns seems to be human nature. In Lebanon, the carefully positioned and rigidly aligned UNHCR containers were moved around and re-positioned after only a few weeks. Big thoroughfares and small side streets emerged – for example, the main street in one Lebanese refugee camp was christened the Champs Elysée. Out of nothing, trade began to take place, and little boutiques sprang up; street-smart handymen and amateur mechanics built mopeds out of scrap; suddenly there were little theatres and dance festivals. Experts say that in less than six months a refugee camp turns into a town. In short: what is needed is a multi-coloured Europe, proximity with respect, an alliance of alterity under the same European law, a creative network of diversity. Over time, the residents of the different towns would mix together quite naturally. The new arrivals would make their way to the nearby ‘European’ towns to work. Or they would open their boutiques there, sell what they produce there. Nobody would need asylum-seeker’s support. The residents of the older indigenous towns become curious. The new arrivals have different and interesting food, and an unknown spice or two. Artists come to look, to paint and to write poetry. Hipster cafés spring up. Students seeking cheap accommodation rent flats to share in New Damascus. Then come the first love stories, and then the first children. Then the first visits from parents. Three generations later – that’s how long it usually takes – the children of the children of the first generation of new arrivals have learned the language of the new homeland – simply because it’s more practical. Another hundred years later, it will probably only be the town’s name – like New Hannover, or Paris, Texas, or Vienna, Virginia in the USA today – that reminds people that its founders came from a different world. This article was originally published on Green European Journal.